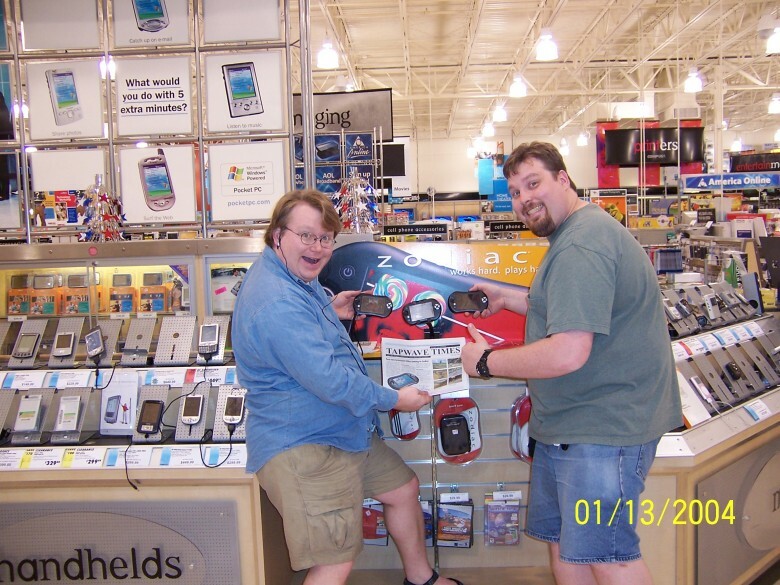 In what is likely going to be the fifth and final entry in my long-running PIC series (here, here, here, and here) chronicling the gradual decline of Palm's retail handheld presence, I am sad but unsurprised to report that Palm handhelds are all but extinct from retail shelves. Indeed, these aging devices are now starting to become scarce online even from top-tier e-tailers, a sure sign of impending doom. Alongside the new year and hopefully a new Palm OS, Palm launched a refreshed Palm.com website on Monday that quite dramatically shoved all of their three remaining handhelds out of the spotlight. Also affected were all of Palm's older smartphones, with only the Treo Pro, 800w and Centro remaining as active models. A random sampling of brick and mortar and web-based retailers over the past week has revealed that TX, E2, and especially the Z22 look set to finally proceed into oblivion in the sad culmination to the era of the classic PDA. Due to some last-minute Christmas gift purchasing (and subsequent returning), I had the opportunity to visit three local Best Buy stores over the past two weeks. Of the three stores I visited, one had a single Palm TX alongside a few E2 handhelds with no Z22s anywhere in sight just a few days before Christmas. The second store I store was totally devoid of all Palm handhelds just a few days after Christmas. 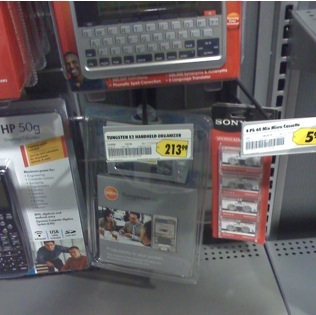 The last store I examined, on December 30th, had removed all of their Palm-related signage and had only a single lonely E2, still sadly overpriced, dangling on the bottom row alongside HP graphing calculators, Sony microcassette tapes, and a Franklin electronic dictionary. On a related note, none of the three stores had the Treo 800w remaining in their wireless section, despite that device having been present in at least one of these stores several months ago. This lends further support to the rumor that the 800w is nearing EOL status and is to be replaced soon by a CDMA Treo Pro. In fact, Palm briefly listed a "CDMA + EVDO" Treo Pro earlier today on their new website in was either a major typo or a goof related to the new website launch. Speaking of the Treo Pro, that rare bird has been reported by some users as being available in some select Best Buy locations in unlocked GSM format but I have personally never seen one in-store so I cannot comment on its absence in my recent retail investigation. Conveniently enough, two of the Best Buys I visited have Staples stores located in the general vicinity so I paid both of those a quick visit last week. Though I do not frequent Staples regularly, they've been one of the remaining stalwarts of Palm products at retail, often carrying accessories for the Treos not offered in the wireless carriers' corporate stores. One of the Staples I visited was an older, free-standing, large-format store. It still had the Palm Z22, E2 and TX dummy devices on display and they all appeared to be in stock and on sale for the normal MSRP. Surprisingly enough, a fairly substantial selection of Palm-branded accessories remained available. The other Staples, a smaller footprint new store in a more densely clustered area uptown, had no Palm handhelds and a very small selection of Treo peripherals. Despite being slightly younger than the E2 and the same age as the flagship Palm TX, the Palm Z22 appears to be the most scare of the remaining Palm OS handhelds. A quick perusal of leading e-tailers Amazon, Newegg, buy.com, Mwave, and Zipzoomfly all turned up no new Z22 units for sale. In fact, hardly any new Z22s remain available anywhere aside from Palm.com, smaller dealers of dubious repute, and E-Bay. The most recent Palm Channelsource newsletter in November actually listed the Treo 680 as reaching End-of-Life status but strangely gave the Z22's SKU (1048NA) alongside it, so it's possible that both devices have met their demise. Amazon and Mwave still have the Palm TX available for sale, with the best price for that device being $259.99 + shipping at Mwave. Amazon still has new E2's available for $189.99 with free shipping. Best Buy has the TX and E2 for sale in their online store but Staples.com lists only the venerable E2 as still in stock. In general, the Palm TX remains the most widely available new Palm OS handheld online. With a 320x480 LCD, 128MB Ram and wi-fi, it's also the most appealing of the remaining Palm handhelds. As mentioned earlier, despite Palm.com's drastic cosmetic overhaul yesterday, the handheld section is still intact and just requires a bit of work to reach. All models are in stock and available for purchase from palm.com with a free shipping promotion as of this writing. There is no pleasant way to say this, so I'll be blunt: the end is nigh for the traditional PDA running the Palm OS. Anyone doubting this reality should only revisit CEO Ed Colligan's words during last month's quarterly earnings report conference call - the company has ceased development of traditional handhelds and will offer the remaining devices until the end of their life in the marketplace. With unsubstantiated rumors swirling online that Palm is releasing all of their staff charged with maintain Garnet, it's even possible that the Centro, Palm's sole remaining Palm OS smartphone, may not have much of a future ahead of it. 2009 looks to be a potentially exciting, invigorating year for Palm and their users alike but the days of the Garnet OS and devices running it are definitely numbered. Anyone desiring a brand-new, factory-sealed Palm handheld should purchase one immediately. Those desiring an affordably-priced used model would be wise to scoop one up now while availability is plentiful and prices are low. I've got two TXs in the closet in case my trusty 755p finally expires. So no matter what happens in the immediate future, my twelve years of Palm OS PIM data will hopefully remain intact, despite the inevitable jabs about 8-tracks, Betamax cassettes and buggy whips! Thanks for the review. I have noticed the same thing as I have been in the electronics and office supply stores. I picked up a clean E2 at Goodwill a couple weeks ago for $10 and I will decide on Thursday whether to get a backup for my TX before they are all gone. I'm not crazy about staying with old technology, but I also don't want to lose my investment in software. Even if I were willing to replace all the software, there are some programs I use that aren't available for other platforms. Finally, as many have said here, there are some things that Palm just does best and there are no good alternative devices. BTW I have an old Z22 and if anyone is saddened by its passing, they can contact me. I might trade it for an old Tungsten slider, which I don't have in my collection. It's just Palm hardballing their customers that if you don't want a cell phone and 2-year contract grafted to your PDA, then they don't want you around. Either that, or they have given up on trying to improve their PDA build quality and are now going to try finally improving the Treo. Either way PDA owners - you'll soon be stuck buying antique Palm PDAs from Palm or Fleabay, or you WILL be assimilated into the "tiny screen cult" on Colligan's island. My TX has no contract, and it suits me. I've switched cell companies 3 times in the last 2.5 years for various reasons, and my TX is just as functional as the day I bought it. Actually, more so, thanks to Dmitry Grinberg and his software. Can't wait to see what DGOS ends up looking like. The problem with the Z22 is that it is more expensive than the Centro, so who would buy it, when for less money, you get a better PDA with a built in phone. I don't see many stand alone PDA's anywhere really anymore. It's too bad for those people who want just a PDA. Maybe Palm will change their mind if NOVA and the new devices do well. Kind of like the iPhone/iPod Touch thing. Can't wait for tomorrow, 2pm EST for the Palm announcement at CES. Many of us who have stuck with PDAs will eventually shift. I know the rumors about new devices have my attention. But I also know some folks who work in "top secret" settings where cell phones aren't allowed. I even know one guy who had to physically disable the IR port on his Palm handheld, because they weren't allowed to have ANY transmitting devices on the work floor. He couldn't even upgrade to newer units because they had Bluetooth built in. Folks in this situation will probably have to revert to Moleskines and fountain pens. You're right about the Z22. I have it in my desk drawer because my wife gave it up for the Centro. I just can't get excited about the small square screen devices, even if they have a phone attached. And their not already three years old. I apologize for the long url, but I can't use tinyurl. P.S. Expansion boards like the old Handspring idea are also sooo dead. Simply out of technical curiosity, I have to ask why? I agree, and in case someone from Palm reads PIC and cares, I'll explain why that saddens me. My Palm handheld died as a PDA as soon as I learned it would run Quicken and WordSmith. As a PDA it saved me from keeping up a weekly, monthly, and yearly paper calendar along with making sure that all of that stuff also got entered into GroupWise (remember that?). But when I found the other applications that would run on it, my humble PDA became a handheld computer that allowed me to take notes at meetings, record my expenses, get my news, keep my mileage, track my album collection, and do my reading. If the Palm handhelds had remained only PDAs, they would have lost their novelty and died out years ago. I don't want to go back to the old days, but I am disappointed that the PDA has "converged" with the phone and not with the laptop. Having a phone conversation on a PDA seems as unnatural as having a phone conversation on my calculator. The idea of a Palm OS laptop has been around for a long time and I hope that the idea is not dead. I don't want a netbook that takes two minutes to boot and doesn't sync with anything. I want a portable computer running the Palm OS with a full 90-95% keyboard and a real screen to match. Throw in a GPS for good measure and if it has a radio in it, I want it for Web browsing and not talking to people. The Foleo had the right design, but the wrong execution. If Palm produced a Foleo II with full Palm handheld capabilities, they might have something. Of course they would need to price it competitively with the netbooks. OK, my semi rant is over. Thanks for your patience. Palm, are you listening? Bring back the T|W and i705! It does everything you are asking for including running PalmOS apps, and is not primarily a phone. "The problem with the Z22 is that it is more expensive than the Centro, so who would buy it, when for less money, you get a better PDA with a built in phone." Well, several things wrong with that analysis. The Centro is not cheaper, unless you have a phone contract, which makes the net cost higher. Secondly, I dislike the tiny screen on the Centro. I'm 49, and already using reading glasses. I want a larger screen for my calandar, calculator, address book, etc. Even the Treo 700P seems too small, really, compared to my T/X. I think Palm missed the boat with PDA type devices. Look at the Ipod Touch: selling briskly, a large touch screen, WiFi, music and video player, decent browser, calandar, address book, and now thousands of apps that you can buy and many are free. That could have been Palm....it would have been a shorter leap for Palm than it was for Apple. Palm already had touch screen, WiFi, great developers community, etc. The only thing they lacked was leadership smart enough to keep going in that direction. Very sad, for those of us that have owned a Palm since 1996. Thanks for the tip. If the news tomorrow is not good, the Nokia may be what I am looking for. Using the Z22 in a comparison is not much of a choice. The Treo screens are actually light years better and the basic same size ... and square. Yes, fools dumped Palm's core PDA biz while Apple listened to what we begged for around here for years. Apple reinvented the wheel and prospers while Palm is about to take her final breath. Oh btw, I post this in bed with my wifi big screen thin non cell iPod Touch and killer browser while my Treo 680 and SSS lays on the desk. Sad. When Handspring gave Palm the Treo on a silver platter years ago in 2003, that miniscule screen was a REAL PITA to get used to compared to my Tungsten C (or Lifedrive, can't recall...). The redundancy of data and charging 2 devices eventually made me bite the bullet and put th ePDA aside, but it sucked to give up a readable screen. My eyes are now 5+ years older, but Palm has made the screen (and the battery life) even *smaller* with the Centro. Wrong direction, fellas! From the looks of the leaked mockups, I'm hoping against hope that the Nova team has finally figured out that battery life and screen size is important to people and they've finally forced Palm to improve things rather than wreck 'em. Give me a PDA-sized screen with the Treo "smile" keyboard and a modern OS that runs legacy Palm apps well, and I'll probably even buy some of their miserable stock. >>I agree, and in case someone from Palm reads PIC and cares, I'll explain why that saddens me. That was sarcasm... the link was about a newly anounced EDA (since PDAs are considered obsolete) it reminded me of my old Visor Edge with its expansion slot. >>Simply out of technical curiosity, I have to ask why? Our network guys block sites. Especially ones that get a lot of hits. I know that this was soo yesterday, but I couldn't get back to it in time before the servers went down. RE: PDA Disappearing and Obsolete? I have been reading about the scarcity of Z22 on the z22 forums on yahoo. I wonder how many were ruined when you accidentally use a metal stylus? Or ruined by dropping a Z22 without a protective case? Or just gets lost in a woman's purse? Considering that I only need a prepaid wireless plan, as I just don't use my cellphone that much, and smartphones are never available on those plans, I don't see myself owning a Palm smartphone any time in the future. On the other hand, there are plenty of devices coming out that are called iPods or media players or web tablets or UMPCs or handheld video game systems that look suspiciously like PDAs to me. Eventually one of them will get some manner of Palm emulation, or even just a set of decent PIM apps that can read in the data from my old Palm, and I will have an upgrade path. If Palm isn't willing to be a part of that, Palm doesn't matter. Would you really want this kludge? Depends how much of a kluge it winds up being. I'm not crazy about Apple hardware, though. Too much proprietary junk, like the connectors. PDAs aren't "dead" in the sense they're unwanted/unneeded. They're "dead" because companies like Palm won't make them anymore. PDAs are as "dead" as the iPod Touch is unpopular. Of course, the convergence/smartphone fanatics will jump on this thread and ramble on with their rants due to their inability to fathom that some people want a handheld computing device that does what the original Palms did, by only paying a single upfront fee and not having to pay some monthly cell phone contract. I don't need a cell contract to keep track of addresses, phone numbers, notes, appointments and schedules, my photo collection, play music/podcasts, or play games. Hell, I used to watch full-length movies on my T3, and think how old THAT thing is. If my T3/m500/m505/m515/V/Vx had required a monthly fee, I would've never bought it. PDAs aren't dead because Palm says so. Palm wants us to THINK PDAs are dead simply because they won't make them. Meanwhile Apple will laugh at Palm all the way to the bank as iPod Touches fly off the shelves. They're being called "enterprise digital assistants" now. Good riddance to CompUSA and Circuit City! Eh. They were at one time a fair place to fondle PDAs. Then that stopped. At one time, the sales staff seemed to be very knowledgeable about HDTVs, from conversations I overheard. They also had good displays for HDTVs too. Still, let them all die. Just don't touch J&R, dammit! i bought my first palm there. I bought mine at some damn trade show in NYC. Hmmm ... possibly it was when it was still called PC Expo. Mine wasn't technically a "Palm"; it was the Handspring Treo 270. I got it off eBay for a steal - the seller claimed that it didn't work. I figured I could get it fixed for cheaper than the price of a new one. But when I got it and took it out of the box it worked fine. Best bargain I've ever found. seller probably just dropped it in the toilet. and by the time it got to you it dried out. what a bargain! seat or handle vs. bowl. think about it.